After four weeks the project has finally come to a close. Adam Wooley and his crew did an incredible job and the finished project looks spectacular. The finishing touches and attention to detail really show in the finished product. I’d highly recommend them to anyone serious about craftsmanship. Below you can see a closeup of some of the textures and plant life. We decided to go with a white rock in the long planter bed to give a nice contrast and add yet another color. The plants in the foreground are mondo grasses and the ones in the back are a type of horsetail. All the way in the back you can also get a look at the copper accent ‘uplights’ that we chose. Lighting is very important and having indirect lighting is paramount to achieve the look we are after. 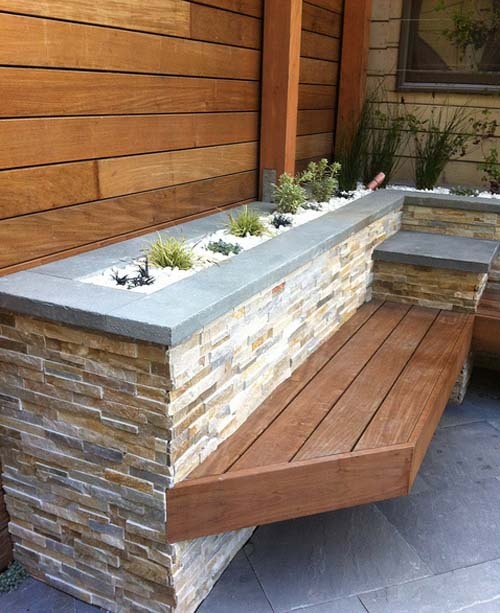 The other planter bed, pictured below, has a lighter color of pebble to match the vertical veneer around the yard and give contrast to the white pebble in the long bed. We also chose a tree fern and other grasses for this area much like the planter in the front of the house. Below you can see how the yard meets the existing structures. We have vines growing currently which we hope to cover the stairs and other areas that we plan to hide. 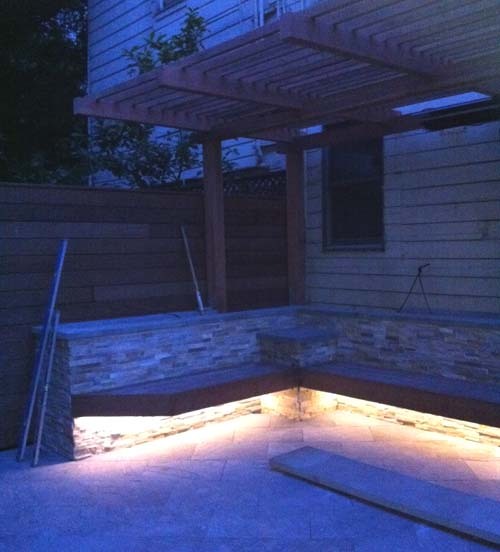 In conclusion, a project like this can be very expensive but very rewarding. 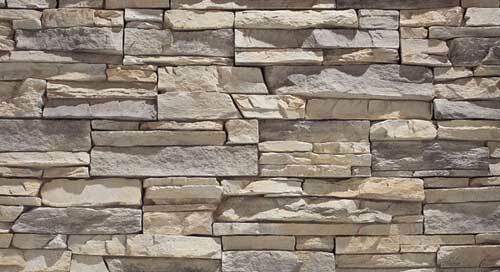 Stones like these, especially the blue slate patio, are not cheap. 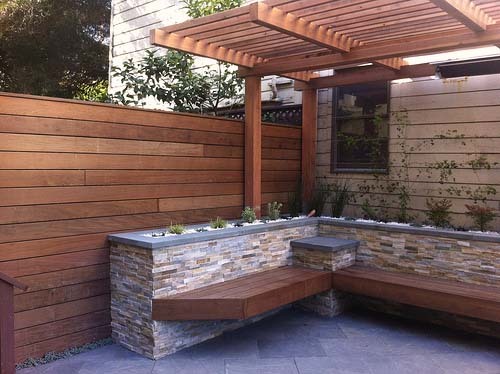 The same is true for the Ipe wood but what you are paying for is quality and a style that cannot be mimicked with other materials. This timeless design and functional space will give us joy for years to come. Well the project is running a little behind schedule but these things happen. We’re designing details on the fly and have packed a lot into this little space. As you can the blue slate patio is almost in but is a painstaking process as they are running diagonally which means lots of 45 degree cuts. We wanted to break up the squareness of the space and I think this definitely accomplishes that goal. Below you can see there is still a ways to go. Below you can see the LED lights we installed from Elemental LED which are based right over the bridge in Emeryville. They were very helpful and ended up buying about 20 feet of their Warm White Waterproof LED strips. We still may need to put a filter over them to warm the color a bit but we’ll wait until the project is finished to make the final call. 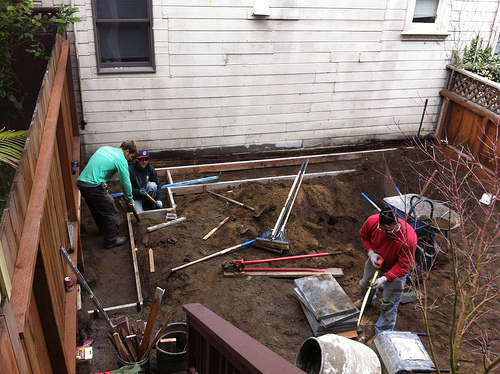 We’re about two weeks into the backyard project and nearing the home stretch. Adam Wooley and his team are making quick work of the job. 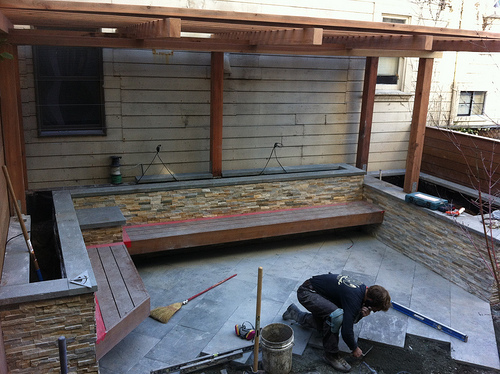 As you can see, the benches are going in as well as the stone veneer. The pergola should also be done this week. Here you can really get a better picture of what everything will look like. The space has really transformed and its starting to feel like an outdoor room. Next up, we are sourcing the LED under-bench lighting as well as planning for the horticulture. More updates to follow next week. 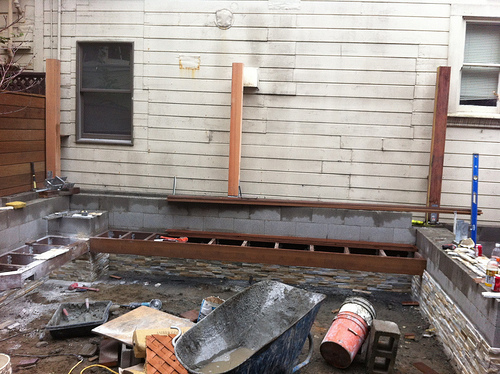 To watch the build live follow the progress on the mid-century backyard photo set. Its only day four here on the project and Adam, Sean, Jorge, and Fidel from Wooley Landscapes have made a huge dent the in workload. Their attention to detail and pride in this project is something you’ll only find in an owner operated business like this one. We’re flushing out ideas on the fly and adapting to the landscape which feels very organic. This is also how we like to do things so it’s a great fit. Above you can see the PVC being laid that will carry the 240v needed to power our IR heatlamp. I’ll provide more info on that once we get closer to that step. 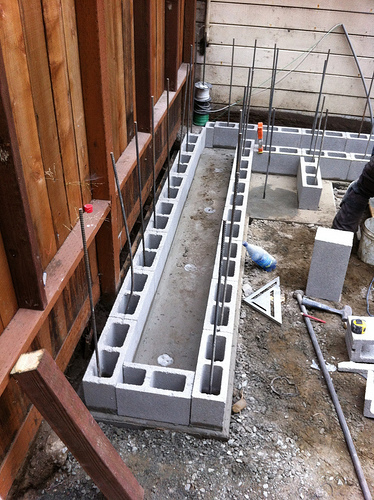 Below you can see the foundation and first row of blocking. There is also low voltage light wiring as well as draining holes in the concrete. More photos to follow tomorrow as the progress continues but here’s a sneak peek of some of the materials that have just arrived. 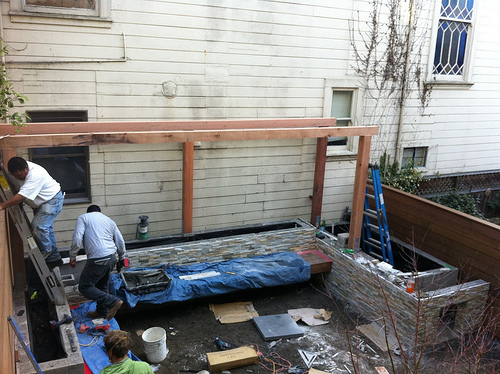 To the right you can see the thick blue slate pavers right next the redwood that used for the pergola. 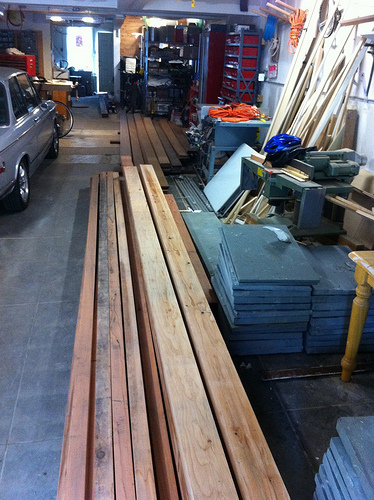 In the back of the photo are the long Ipe clapboards that will be used for the walls and the benches. After three years and a few false starts we have finally gotten around to focusing on the backyard. We have had many ideas over the past few years but it wasn’t until we hired Adam Wooley and his crew that we came up with an idea that represents the house and our eclectic style. The theme is mid-centrury modern and inspired by the Eames’ with clean lines, sharp angles, and lots of mood lighting. Below you can see the preliminary design. A few things have changed since then but you’ll just have to wait to see the finished product. 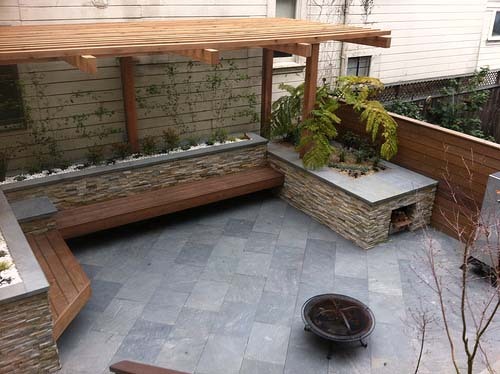 The slate patio is made of blue slate measuring 2′x3′ at 2″ thick. 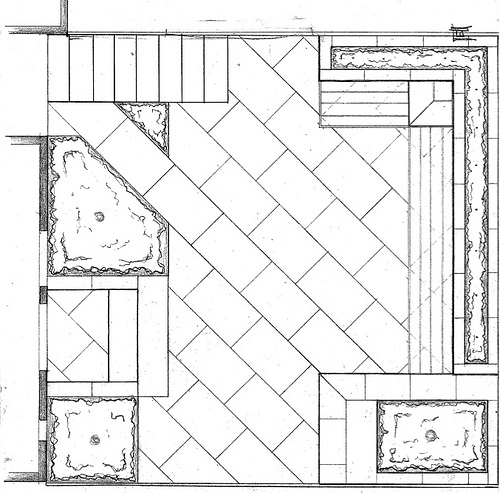 We decided to run them diagonally to break up the square nature of the backyard. 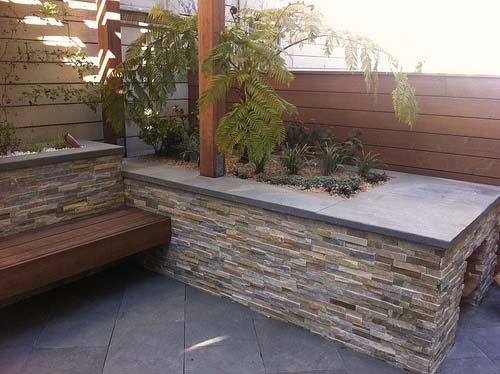 The stone walls around the back are at differing heights to give visual interest and are going to be wrapped in a stacked slate veneer like the one you see below. The fences on both sides will be getting wrapped in very long horizontal Ipe clapboards which will provide a clean look. The two benches you can see in the diagram are also made of Ipe and will appear to be floating as there will be no posts supporting them. This in conjuction with lighting underneath will give them the effect of being weightless and will make the space feel bigger. 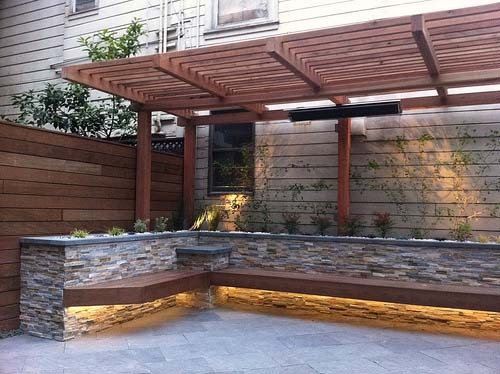 There will also be a pergola with heat lamps over part of the yard but more on that later. I’ll be updating with more photos in a few days. For the time being, here is what the yard looks like. 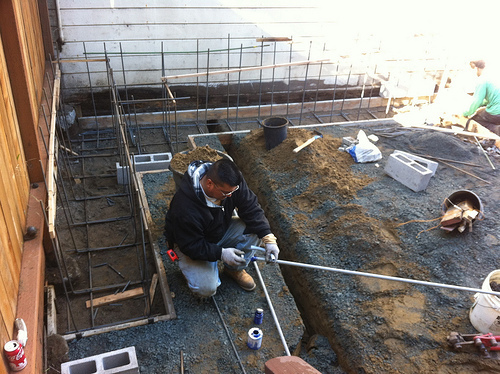 They are getting ready to pour the footing for the walls and benches. 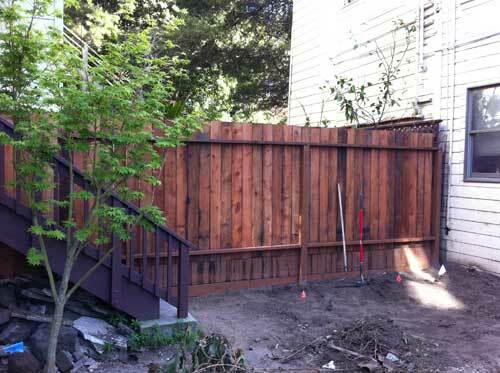 Although you are seeing the unfinished sides of the fences in the photos below, we’re moving ahead slowly on the backyard project. 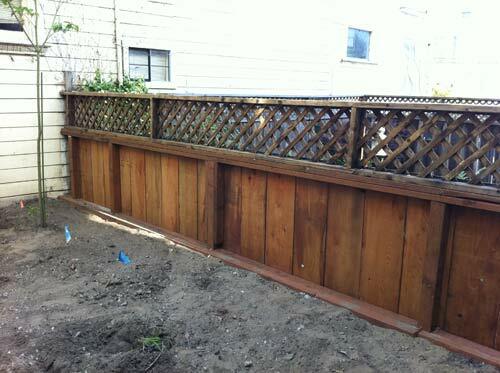 The old dilapidated fences have been removed and framed with new redwood. 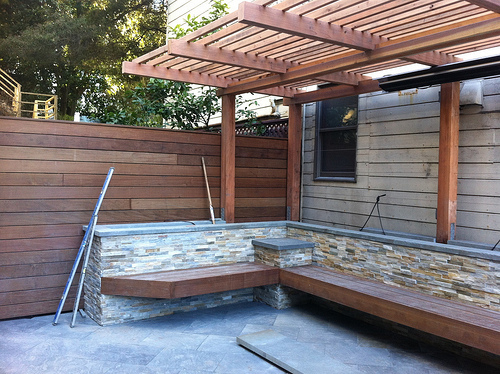 Once we get the masonry is done, we will be wrapping the fences in beautiful ipe wood. More to come as the project continues. To see where the project began check out the rest of the backyard project blog. 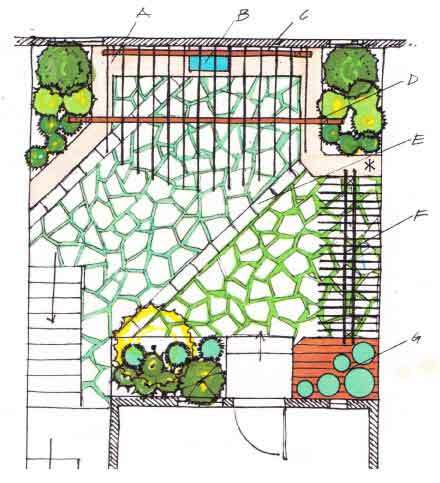 Above is a rendering we had drawn up by a local landscape architect. Fortunately, we decided to go in another direction given two factors. The first being an outrageous price for a simple design, and the second being, we can do better. Our design is going to be much more sleek and modern with more of a post-modern feel. 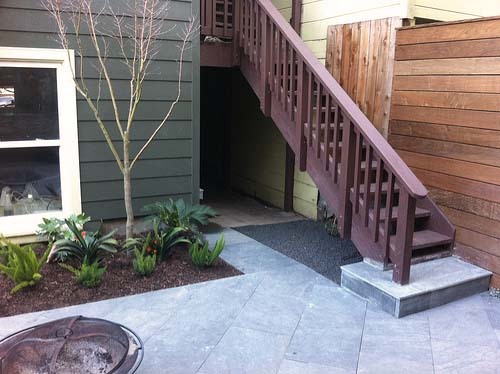 We will contract out the hardscape work to an experienced mason but we are going to take care of the rest. Since the back of the house has been undergoing renovations we have been slow in the past few months, but we’re hoping to pickup again here soon. Our contractor is just finishing up so hopefully the ground will warm up again here soon and we can get rolling. For now, take a look at the work we started a few months back.